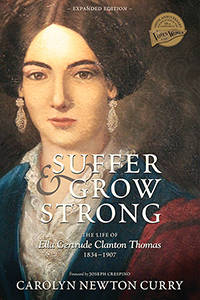 Ella Gertrude Clanton Thomas was an intelligent, spirited woman bornin 1834 to one of the wealthiest families in Georgia. At the age of fourteen she began and kept a diary for forty-one years, documenting her life before, during, and after the Civil War. In 1851 she graduated from Wesleyan Female College in Macon, Georgia. Then in 1852 she married her Princeton-educated husband expecting to live a charmed life. However, with the coming of the Civil War and its aftermath, her life changed forever. Thomas experienced loss of wealth, bankruptcy, the death of loved ones, serious illness, and devastating family strife. In 1893, Thomas moved to Atlanta where she became active in many women’s organizations. She found comfort in her work with the Women’s Christian Union and the Suffrage Movement, and began producing articles for newspapers that describe her work after the war. In 1899 Thomas was elected president of the Georgia Woman Suffrage Association. Because of her own losses, she was sensitive to the well-being of other women. Her life is an amazing story of survival and transformation that speaks to women in our own time.